^ Moore, Stephen. Hauser, Stefan; Luginbühl, Martin, 编. Contrastive Media Analysis. 2012: 51 （英语）. ^ 2.00 2.01 2.02 2.03 2.04 2.05 2.06 2.07 2.08 2.09 2.10 About us. 經濟學人. [2011-05-01]. （原始内容存档于2018-03-24） （英语）. ^ Our endorsement: Who should govern Britain?. 經濟學人. 2015-05-02 [2015-05-11]. （原始内容存档于2015-05-06） （英语）. ^ 4.0 4.1 4.2 The Economist’s Circulation Revenue Increased by 21% Year on Year as Latest ABC Figures Show Profitable Volume Growth. 經濟學人. 2017-08-10 [2017-08-22]. （原始内容存档于2017-08-22） （英语）. ^ 5.0 5.1 5.2 2017年8月5日出版的《經濟學人》北美版封面照片 (jpg). [2017-08-14]. （原始内容存档于2018年7月2日）. ^ 2017年7月22日出版的《經濟學人》歐洲版封面照片 (jpg). [2017-08-14]. （原始内容存档于2018年7月2日）. ^ 7.0 7.1 7.2 7.3 7.4 2017年8月12日出版的《經濟學人》亞洲版封面照片 (jpg). [2017-08-14]. （原始内容存档于2018年7月2日）. ^ Locations. 經濟學人集團. [2009-09-12]. （原始内容存档于2009-02-12） （英语）. ^ Why does The Economist call itself a newspaper?. 經濟學人. 2013-09-01. （原始内容存档于2014-03-15） （英语）. ^ Brook, Stephen. Let the bad times roll. 衛報 (倫敦). 2008-02-25 [2010-03-26]. （原始内容存档于2010-11-01） （英语）. ^ Exor to get 40 percent of The Economist after Pearson stake sale: source. 路透社. 2015-08-11 [2016-04-21]. （原始内容存档于2015-11-17） （英语）. ^ Ownership. 經濟學人集團. [2016-04-21]. （原始内容存档于2016-04-23） （英语）. ^ Cartmail, Chris St. Pearson sells Financial Times with Economist next on the block. Business Sale Report. 2015-07-26 [2016-04-22]. （原始内容存档于2015-09-27） （英语）. ^ Results at a glance. 經濟學人集團. [2017-08-01]. （原始内容存档于2017-08-14） （英语）. ^ Hugh-Jones, Stephen. So what's the secret of 'The Economist'?. 獨立報 (倫敦). 2006-02-26 [2008-04-27]. （原始内容存档于2015-05-27） （英语）. ^ Economist Media Directory. 經濟學人. [2016-04-24]. （原始内容存档于2016-04-24） （英语）. ^ Scottish independence: Don’t leave us this way. 經濟學人. 2014-07-12 [2014-07-26]. （原始内容存档于2014-07-25） （英语）. [A] product of the Caledonian liberalism of Adam Smith and David Hume. 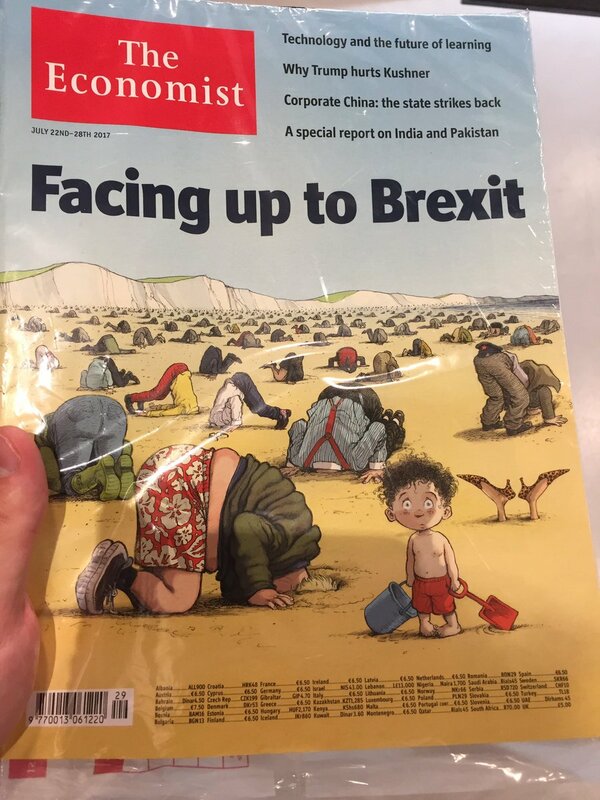 ^ How our readers view The Economist. 經濟學人. [2016-04-22]. （原始内容存档于2007-05-15） （英语）. ^ Hirschorn, Michael. The Newsweekly’s Last Stand. 大西洋月刊 (2009年07/08期). [2017-08-01]. （原始内容存档于2017-08-01） （英语）. ^ Oberholzer-Gee, Felix; Bharat, N. Anand; Lizzie, Gomez. The Economist (Harvard Business School Case 710-441, July 2010). 哈佛商學院. Hbs.edu. [2016-04-23]. （原始内容存档于2016-04-23） （英语）. ^ Oberholzer-Gee, Felix; Bharat, N. Anand; Lizzie, Gomez. The Economist (Harvard Business School Case 710-441, July 2010) (PDF). 哈佛商學院. American.edu. [2016-04-23]. （原始内容 (PDF)存档于2013-09-27） （英语）. ^ Our Brands - The Economist. 經濟學人集團. [2016-04-23]. （原始内容存档于2016-04-17） （英语）. [T]o take part in a severe contest between intelligence, which presses forward, and an unworthy, timid ignorance obstructing our progress. ^ Our first issue. 經濟學人. 1843-09-02 [2016-04-25]. （原始内容存档于2016-04-26） （英语）. ^ From the Corn Laws to Your Mailbox. 麻省理工大學出版社博客. 2007-01-30 [2010-06-11]. （原始内容存档于2010-06-12） （英语）. ^ Prospectus. 經濟學人. 1843-08-05 [2006-12-27]. （原始内容存档于2007-02-12） （英语）. ^ Middleton, Roger. Walter Bagehot (1826-77): A Man for All Seasons?. (编) Mata, Tiago. The Economist in history: the political economy of liberal journalism. 2017-03-29 [2017-08-14] （英语）. ^ 27.0 27.1 27.2 27.3 27.4 Our History. 經濟學人集團. [2017-07-21]. （原始内容存档于2017-07-12） （英语）. ^ Row erupts over Economist Building revamp. The Architect's Journal. 2017-02-03 [2017-08-03]. （原始内容存档于2017-08-03） （英语）. ^ Our new design. 經濟學人. 2001-05-10 [2017-08-12]. （原始内容存档于2017-08-13） （英语）. ^ Our new China section: A meteoric rise. 經濟學人. 2012-01-27 [2016-07-01]. （原始内容存档于2016-08-01） （英语）. ^ Arana, Gabriel. Pearson Unloads $731 Million Stake In The Economist. 赫芬頓郵報. 2015-08-12 [2015-08-15]. （原始内容存档于2015-08-16） （英语）. ^ West, Karl. The Economist becomes a family affair. 衛報 (倫敦). 2015-08-15 [2015-08-15]. （原始内容存档于2015-08-15） （英语）. ^ Daily chart: An inventory of editors. 經濟學人. 2015-01-23 [2017-08-12]. （原始内容存档于2017-08-13） （英语）. ^ Zanny Minton Beddoes appointed new editor of The Economist. 經濟學人集團. 2015-01-22 [2016-07-01]. （原始内容存档于2016-03-04） （英语）. ^ Globalisation: The redistribution of hope. 經濟學人. 2010-12-16 [2011-04-23]. （原始内容存档于2011-04-22） （英语）. ^ Monbiot, George. Punitive – and it works. 衛報 (倫敦). 2005-01-11 [2012-05-25]. （原始内容存档于2012-04-29） （英语）. ^ Buttonwood: Let them heat coke. 經濟學人. 2008-06-12 [2012-05-25]. （原始内容存档于2012-02-21） （英语）. ^ Gay marriage: Let them wed. 經濟學人. 1996-01-04 [2016-07-01]. （原始内容存档于2016-04-24） （英语）. ^ Failed states and failed policies: How to stop the drug wars. 經濟學人. 2009-03-05 [2016-07-01]. （原始内容存档于2016-06-25） （英语）. ^ Tax reform in America: A simple bare necessity. 經濟學人. 2012-02-04 [2012-05-25]. （原始内容存档于2012-05-25） （英语）. ^ Smoking and public health: Breathe easy. 經濟學人. 2010-06-10 [2012-05-25]. （原始内容存档于2012-02-21） （英语）. ^ Corporal punishment: Spare The Rod, Say Some. 經濟學人. 2008-05-31 [2016-07-01]. （原始内容存档于2016-08-08） （英语）. ^ The United States and Mexico: Sense, not Sensenbrenner. 經濟學人. 2006-03-30 [2016-07-01]. （原始内容存档于2016-08-08） （英语）. ^ Lexington: Reflections on Virginia Tech. 經濟學人. 2009-04-08 [2011-04-13]. （原始内容存档于2011-05-11） （英语）. ^ Obituary: God. 經濟學人. 1999-12-23 [2016-07-01]. （原始内容存档于2016-03-05） （英语）. ^ 48.0 48.1 Labour doesn’t deserve it. 經濟學人. 1997-04-24 [2017-08-03]. （原始内容存档于2017-08-03） （英语）. ^ 49.0 49.1 US presidential endorsements. 經濟學人. 2008-10-28 [2017-08-03]. （原始内容存档于2017-08-02） （英语）. ^ The Economist explains itself: Is The Economist left- or right-wing?. 經濟學人. 2013-09-03 [2017-08-03]. （原始内容存档于2017-08-03） （英语）. gives its endorsement to the candidate or party most likely to pursue classically liberal policies. ^ The World Bank: The Wolfowitz affair. 經濟學人. 2007-04-12 [2017-08-01]. （原始内容存档于2017-08-01） （英语）. ^ Silvio Berlusconi's record: The man who screwed an entire country. 經濟學人. 2011-06-09 [2017-08-01]. （原始内容存档于2011-08-18） （英语）. ^ O'Hanlon, Paul. Report of Rome anti-war demo on Saturday 24th with photos. Independent Media Center（英语：Independent Media Center）. 2005-09-30 [2006-12-27]. （原始内容存档于2007-02-11） （英语）. ^ If he stays there will be trouble: Congo’s president refuses to go. 經濟學人. 2016-12-24 [2017-08-01]. （原始内容存档于2017-07-31） （英语）. ^ Zimbabwe: Act before the tyrant dies. 經濟學人. 2015-10-03 [2017-08-01]. （原始内容存档于2017-08-01） （英语）. ^ Argentina: Cristina in the land of make believe. 經濟學人. 2008-05-01 [2016-07-03]. （原始内容存档于2016-04-06） （英语）. ^ Just go. 經濟學人. 1998-09-17 [2017-08-01]. （原始内容存档于2017-08-01） （英语）. ^ Iraq: Resign, Rumsfeld. 經濟學人. 2016-07-03 [2006-12-27]. （原始内容存档于2011-05-27） （英语）. ^ The war in Iraq: The case for war—revisited. 經濟學人. 2003-07-17 [2017-08-03]. （原始内容存档于2017-08-02） （英语）. ^ Iraq: Mugged by reality. 經濟學人. 2007-03-22 [2016-07-03]. （原始内容存档于2016-03-09） （英语）. ^ Free exchange: How to be wrong. 經濟學人. 2017-06-10 [2017-08-03]. （原始内容存档于2017-08-02） （英语）. ^ Our American endorsement: Which one?. 經濟學人. 2012-11-03 [2012-11-04]. （原始内容存档于2012-11-04） （英语）. ^ The presidential election: America’s best hope. 經濟學人. 2016-11-05 [2017-08-03]. （原始内容存档于2017-08-03） （英语）. ^ Crunch time. 經濟學人. 2000-11-02 [2017-08-03]. （原始内容存档于2017-08-01） （英语）. ^ America's next president: The incompetent or the incoherent?. 經濟學人. 2004-10-28 [2016-07-03]. （原始内容存档于2016-07-13） （英语）. ^ Britain’s election: Vote conservative. 經濟學人. 2001-05-31 [2017-08-03]. （原始内容存档于2017-08-03） （英语）. ^ Our British election endorsement: There is no alternative (alas). 經濟學人. 2005-04-28 [2017-08-03]. （原始内容存档于2017-08-03） （英语）. ^ The British election: The middle has fallen out of British politics. 經濟學人. 2017-06-03 [2017-08-03]. （原始内容存档于2017-08-03） （英语）. ^ Style Guide. 經濟學人. [2013-02-08]. （原始内容存档于2013-02-07） （英语）. ^ Style Guide: Tone. 經濟學人. [2016-07-15]. （原始内容存档于2007-03-11） （英语）. ^ Johnson. 經濟學人. 2004-05-10 [2006-12-27]. （原始内容存档于2006-12-19） （英语）. ^ If France’s Reforms Succeeded: The Macron miracle. 經濟學人. 2017-07-06 [2017-07-26]. （原始内容存档于2017-07-25） （英语）. ^ Eine deutsche Atombombe?. 經濟學人. 2017-03-04 [2017-07-26]. （原始内容存档于2017-07-25） （英语）. ^ Nationalising Northern Rock: A bank by any other name. 經濟學人. 2008-02-21 [2008-09-16]. （原始内容存档于2012-02-22） （英语）. 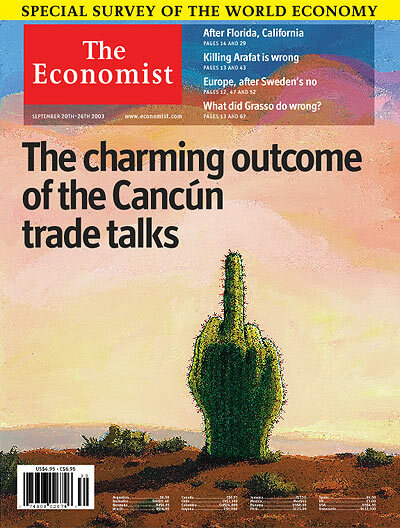 ^ World trade talks: Cancún's charming outcome. 經濟學人. 2003-09-18 [2017-08-03]. （原始内容存档于2017-08-02） （英语）. ^ Letters. 經濟學人. 2003-10-04 [2016-07-15]. （原始内容存档于2016-03-26） （英语）. ^ An editor’s farewell: The case for liberal optimism. 經濟學人. 2017-08-03 [2015-01-29]. （原始内容存档于2015-02-01） （英语）. ^ The way ahead. 經濟學人. 2016-10-08 [2017-07-21]. （原始内容存档于2017-08-01） （英语）. ^ Media directory. 經濟學人. [2017-07-21]. （原始内容存档于2017-07-21） （英语）. ^ Kluth, Andreas. Why The Economist has no bylines. Andreaskluth.org. 2008-11-20 [2017-07-21]. （原始内容存档于2008-12-20） （英语）. ^ 83.0 83.1 83.2 Why are The Economist’s writers anonymous?. The Economist. 2013-09-05 [2018-03-26]. （原始内容存档于2018-03-26）. ^ 84.0 84.1 Fallows, James. The Economics of the Colonial Cringe: Pseudonomics and the Sneer on the Face of The Economist. 華盛頓郵報. 1991-10-16 [2008-04-27]. （原始内容存档于2010-03-23） （英语）. The magazine is written by young people pretending to be old people...If American readers got a look at the pimply complexions of their economic gurus, they would cancel their subscriptions in droves. ^ Saul, John Ralston. The Doubter's Companion: A Dictionary of Aggressive Common Sense. Free Press. 2012-01-15. ISBN 978-0743236607 （英语）. ... hides the names of the journalists who write its articles in order to create the illusion that they dispense disinterested truth rather than opinion. This sales technique, reminiscent of pre-Reformation Catholicism, is not surprising in a publication named after the social science most given to wild guesses and imaginary facts presented in the guise of inevitability and exactitude. ^ Allen, Katie. 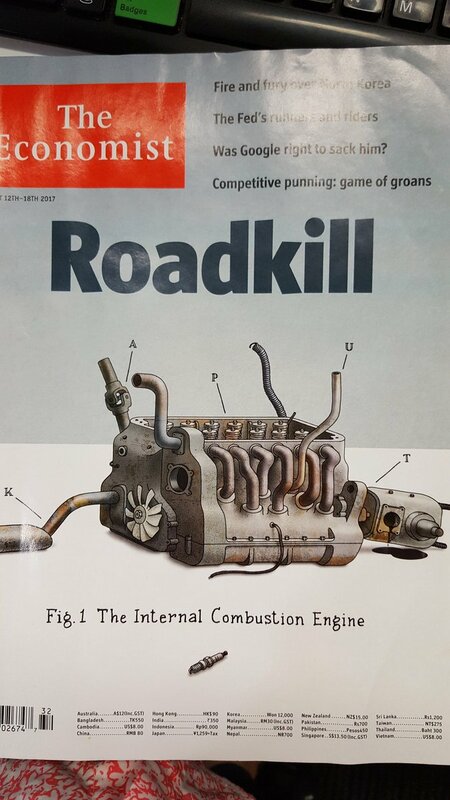 Economist launches audio magazine. 衛報 (倫敦). 2007-07-11 [2007-08-16]. （原始内容存档于2007-08-21） （英语）. ^ Daft, Richard L.; Kendrick, Martyn; Vershinina, Natalia. Management. Cengage Learning EMEA. 2010: 788 （英语）. ^ Langfitt, Frank. 'Economist' Magazine Wins American Readers. 全国公共广播电台. 2006-03-08 [2006-12-27]. （原始内容存档于2012-06-05） （英语）. ^ Moseley, Ray. "Economist" aspires to influence, and many say it does. (付費存檔). 芝加哥論壇報. 1993-09-26 [2008-05-14] （英语）. Never in the history of journalism has so much been read for so long by so few. ^ Special reports. 經濟學人. [2013-08-09]. （原始内容存档于2013-08-08） （英语）. ^ Technology Quarterly. 經濟學人. [2013-08-09]. （原始内容存档于2009-02-17） （英语）. ^ The World In. 經濟學人. [2017-09-13]. （原始内容存档于2017-09-13） （英语）. ^ 黃翹恩. 《經濟學人》中文版面世. 蘋果日報. 2015-04-08 [2017-09-13]. （原始内容存档于2017-09-14） （中文（台灣）‎）. ^ 94.0 94.1 94.2 94.3 94.4 94.5 Where do The Economist’s unusual names come from?. 經濟學人. 2013-09-06 [2017-07-23]. （原始内容存档于2017-07-09） （英语）. ^ Adrian Wooldridge. 經濟學人. [2019-04-18] （英语）. ^ Dominic Ziegler. 經濟學人. [2019-04-18] （英语）. ^ Labour of love: Introducing Bartleby, our new column on management and work. 經濟學人. 2018-05-26 [2019-04-18] （英语）. ^ Philip Coggan. 經濟學人. [2019-04-18] （英语）. ^ The Bello column: Choosing a Name. 經濟學人. 2014-01-30 [2014-03-25]. （原始内容存档于2014-03-10） （英语）. ^ Michael Reid. 經濟學人. [2019-04-18] （英语）. ^ John O’Sullivan. 經濟學人. [2019-04-18] （英语）. ^ The original tea party: The Economist’s new China column: Chaguan. 經濟學人. 2018-09-13 [2019-04-18] （英语）. ^ The surprising face of China’s surveillance state. 1843 Magazine. 2018-11-28 [2019-04-18] （英语）. ^ Jeremy Cliffe. 經濟學人. [2019-04-18] （英语）. ^ Ryan Avent. 經濟學人. [2019-04-18] （英语）. ^ Welcome (back) to the Johnson column. 經濟學人. 2013-07-23 [2017-07-23]. （原始内容存档于2017-08-03） （英语）. ^ Lane Greene. 經濟學人. [2019-04-18] （英语）. ^ James Astill. 經濟學人. [2019-04-18] （英语）. ^ Patrick Foulis. 經濟學人. [2019-04-18] （英语）. ^ Henry Tricks. 經濟學人. [2019-04-18] （英语）. ^ Ann Wroe. 經濟學人. [2019-04-18] （英语）. ^ Great expectations—the social sciences in Great Britain. Commission on the Social Sciences. 2004: 88. ISBN 978-0-7658-0849-3 （英语）. ^ Krugman, Paul R.; Obstfeld, Maurice. International Economics. Pearson Education. 2009: 396. ISBN 978-0-321-55398-0 （英语）. ^ On the Hamburger Standard. 經濟學人. 1986-09-06 [2017-07-23]. （原始内容存档于2017-08-02） （英语）. ^ Letters. 經濟學人. 2005-02-03 [2017-07-22]. （原始内容存档于2017-08-01） （英语）. ^ Letters: On Amnesty International and human rights, Iraq, tax breaks. 經濟學人. 2007-04-04 [2017-07-22]. （原始内容存档于2017-08-01） （英语）. ^ Seow, Francis T. The Media Enthralled: Singapore Revisited. Lynne Rienner Publishers. 1998: 171–175 （英语）. ^ Economist Innovation Awards Categories. 經濟學人集團. [2017-07-23]. （原始内容存档于2013-01-17） （英语）. ^ Innovation Summit 2016. 經濟學人. [2017-07-23]. （原始内容存档于2017-08-01） （英语）. ^ What is your vision of the future?. 新海峽時報. 2000-04-22 [2017-07-23] （英语）. ^ 撕頁、禁雜誌…亞洲網路審查大挑戰！. 天下雜誌. 2011-08-31 [2017-07-23]. （原始内容存档于2017-08-01） （中文（台灣）‎）. ^ Censorship: Publish and be damned. 經濟學人. 2017-07-26 [2017-07-26]. （原始内容存档于2017-08-25） （英语）. ^ Crispin, Shawn W. Inconvenient truths in Singapore. 亞洲時報. 2006-12-01 [2007-01-31] （英语）. ^ Censorship in India: Censors’ sensibilities. 經濟學人. 2010-12-07 [2017-07-23]. （原始内容存档于2017-07-30） （英语）. ^ Guardian and RFI correspondent risks two years in jail. 無國界記者. [2017-07-23]. （原始内容存档于2002-08-30） （英语）. ^ Acquitted journalist ordered to leave Zimbabwe. 愛爾蘭時報（英语：The Irish Times）. 2002-07-16 [2017-08-03]. （原始内容存档于2017-08-02） （英语）. ^ Iran Bans The Economist Over Map. 耶路撒冷郵報. 2006-06-14 [2017-08-01]. （原始内容存档于2017-08-01） （英语）. 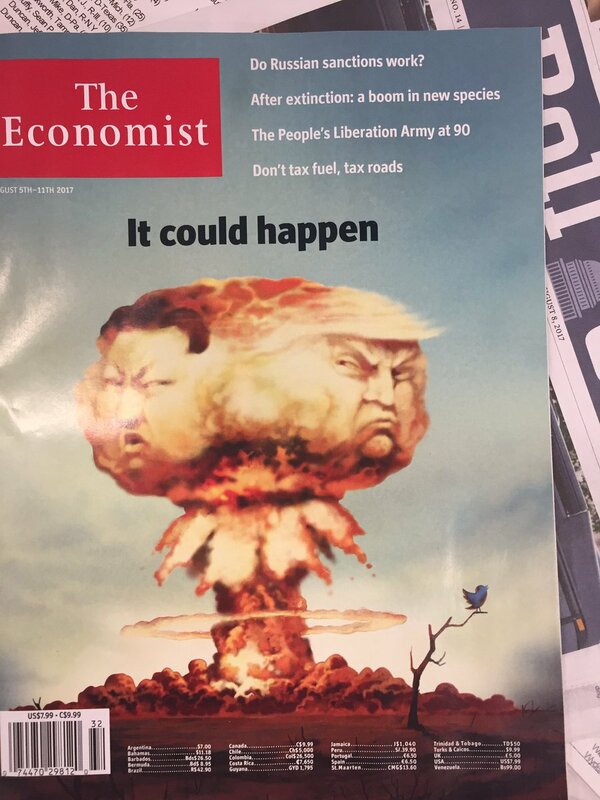 ^ The Economist’s website is now censored in China—and all it took was one satirical cover. Quartz. 2016-04-07 [2017-07-23]. （原始内容存档于2017-08-02） （英语）. ^ Marx, Karl. The Eighteenth Brumaire of Louis Bonaparte, VI. 1852 （英语）. The London Economist, the European organ of the aristocracy of finance, described most strikingly the attitude of this class. ^ 50 Best Magazines. 芝加哥論壇報. 2006-06-15 [2017-07-23]. （原始内容存档于2017-08-01） （英语）. [I]t does not feel moved to cover a faraway land only at a time of unmitigated disaster. ^ Mitchell, Amy; Gottfried, Jeffrey; Kiley, Jocelyn; Matsa, Katerina Eva. Political Polarization & Media Habits. 皮尤研究中心. 2014-10-21 [2017-08-01]. （原始内容存档于2017-07-27） （英语）. ^ Kearney, Michael W. Trusting News Project Report 2017. 密蘇里大學. 2017-07-25 [2017-08-10]. （原始内容存档于2017-08-18） （英语）. ^ Guaglione, Sara. CFOs Favor 'WSJ,' 'The Economist' As News Consumers. Publisher Daily. 2017-06-23 [2017-07-30]. （原始内容存档于2017-08-01） （英语）. ^ Desert Island Discs: Bill Gates (音頻). BBC Radio 4. 2016-02-05 [2017-07-23]. （原始内容存档于2016-03-20） （英语）. ^ Sullivan, Andrew. London Fog. 新共和. 1999-06-14 [2014-09-02]. （原始内容存档于2014-09-04） （英语）. ^ 139.0 139.1 Not so groovy. 新共和. 1999-06-14 [2008-04-27]. （原始内容存档于2005-03-06） （英语）. ^ Finkel, Rebecca. Nasty barbs fly between New Republic and Economist. Media Life. [2017-07-23]. （原始内容存档于2015-11-07） （英语）. ^ Jon Meacham Wants Newsweek to Be More Like Hayes' Esquire. New York Observer. [2017-07-23]. （原始内容存档于2008-07-07） （英语）. ^ Bangladesh: Discrepancy in Dhaka. 經濟學人. 2012-12-08 [2017-07-23]. （原始内容存档于2017-08-01） （英语）. ^ Trying war crimes in Bangladesh: The trial of the birth of a nation. 經濟學人. 2012-12-15 [2017-07-23]. （原始内容存档于2017-07-03） （英语）. ^ American slavery: Blood cotton. 經濟學人. 2014-09-05 [2014-09-06]. （原始内容存档于2014-09-06） （英语）. Almost all the blacks in his book are victims, almost all the whites villains. ^ Baptist, Edward. What the Economist Doesn't Get About Slavery—And My Book. Politico. 2014-09-07 [2015-06-20]. （原始内容存档于2015-05-07） （英语）.